Social media is an inescapable part of life today, and a key component to marketing virtually every industry on the planet, including real estate. Whether used for networking, collaborating or sharing information, today’s social media can deliver volumes of diverse content with lightning speed to massive audiences. These platforms provide the opportunity to meet people, network and expand your community. Like any venture worth doing, social media requires planning on your part to achieve the highest success. It may be hard to believe, but in just 30 minutes a week, you can create, deploy and maintain an effective plan to engage consumers on social media. It’s important to understand which network is most appropriate for which type of content. For example, personal content you share on Facebook may not always be suitable for the more business-oriented LinkedIn, but your LinkedIn content can be easily repurposed on Facebook. Understanding what each social media network is designed to do and providing a customized message for it can resonate with your audience and get them to follow you. You don’t have to post every day or send out hourly tweets, but you do have to be consistent. Three to five posts a week is an ideal frequency to start out with. The objective here is to get your audience accustomed to seeing your name through reliable and repeated communications, and then anticipating your next post. One third personal interests, such as fitness, health, sports, hobbies, good news, celebrations, etc. One third real estate eye candy—for example, listings, photos with happy clients, photos taken on-the-go throughout your day. One third industry knowledge, including tips and advice articles, real estate data, and market trends. Good content helps you identify future sales opportunities, demonstrates your local expertise, and enables you to nurture existing relationships outside the sales cycle. Less-than-ideal content is auto-posts, links to every single one of your listings, a play-by-play of your day, or “contact me” sales messages. It’s vital to offer content that is of interest and value to your audience. The objective here is to get them to see you as their approachable, go-to industry expert. It’s not always about stating fact after fact. Asking your community for something is an effective way to get them to engage with you: Share an experience and invite their input or opinion. For example, ask your followers, “What’s your favorite booth at the new farmer’s market?” Overselling or boring your audience is a surefire way to get them to lose interest in you or unsubscribe from your newsfeed. Once you know what to post, get in the habit of populating a weekly content calendar with your ideas. Feel free to be creative here—maybe use different color sticky notes for days of the week or stickers to designate content types—so that you can see your patterns of consistency at a glance. 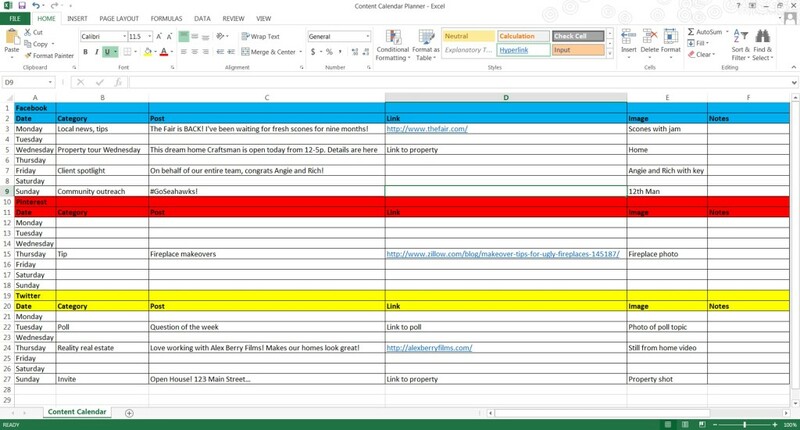 Once you get your content fairly organized, drop it into an Excel file that you can easily update and access on a daily basis. Monday News: Source a local news article that highlights what’s happening in your community. Tuesday Tell-All: Share a photo of something that defines you. For example, if you’re a foodie, considering showcasing a favorite dish that you recently prepared or an up-and-coming local restaurant that you enjoy. Property Tour Wednesday: Snap a photo while showing homes to clients, showcase a unique element of the homes you are previewing, or share an interesting aspect of your property-touring day. Thursday Trivia: Highlight an article that reveals fun facts about real estate in your local community, or that provides unexpected advice for buyers and sellers. Friday Client Spotlight: Share a client success story. This could be a past client getting the keys to their first home, or a seller who was able to find the perfect buyer in record time! Don’t want to share a photo of the client’s face? Get creative and include photos of pets, landscapes, landmarks, etc. Saturday Show & Tell or Sunday Open House: Showcase one of your current listings. Be careful not to position the post as a “hard sell.” Instead, highlight some of the lifestyle benefits of the home or community. If you’re away from your desk or out of the office on vacation when you want to post content—or maybe you don’t want to risk forgetting to pull the trigger—you can use tools such as TweetDeck or Hootsuite to schedule a tweet or Facebook post days, weeks or months ahead of time. Simply create a new message, drop in your text, click a calendar icon and pick exactly when you want your message to release. Consider blocking off 30 minutes per week to schedule all of your content in bulk. Set up alerts to notify yourself when someone responds to you on social media. As with returning calls and emails from leads and clients, sooner is always better than later when responding to your audience. Go mobile! Make sure you have your social media apps easily accessible on your phone or tablet so that you can reach out to a lead or client immediately after they respond to something you posted. Ask yourself which networks your clients are using, not which ones are your personal favorites. Leverage LinkedIn to showcase your skills, professional certifications and awards. Tag your contacts on social to instantly double your social reach! Schedule social media content to publish throughout the week. Turn on push notifications to alert you of activity on your social content. Take the same approach when using social media to reach out to your audience. You can achieve success when you communicate to your audience within the social media networks they also participate in; you can achieve greatsuccess if you anticipate your audience’s interests and have engaging content all ready to go. Which two social media networks do you engage in the most? Can I share photos or post about our home shopping/selling experiences together? Planning your social media goals and strategies go hand in hand. Ask yourself, “What do I want to get out of using social media?” Measuring the success of your efforts in social media comes down to building your audience (Reach), and motivating your audience to interact with your content (Engagement). It’s also important to listen to the content being shared in your newsfeed, and monitor for opportunities to interact with clients past, present and future. Wishing a client happy birthday, and clicking “like” or commenting on a friend’s photo goes a long way! You can also use your newsfeed to listen for big milestones in someone’s life that may prompt a move—for example, a new baby, new job, or a child leaving for college. While you don’t need the most followers to win at social media, it’s wise to understand your Reach numbers simply to know if your content had any impact. Sites such as Facebook, Twitter and LinkedIn all have analytic tools to help you track connections, followers, likes, viewers, subscribers and website visitors. You can also use a tool like Google Analytics. Engagement is why it’s so important to have content that inspires action among your audience. If your engagement is low, you need to revisit your posts and messages, and ensure they are what your followers want to see. Engagement metrics include clicks on your links, retweets, shares and comments on your posts. Again, use the analytic tools in each social media platform to measure these metrics. Finally, the biggest measurement of all: Conversion. Your social media content should always link back to your website, which is at the core of your online efforts and a central repository for further information when audiences click something on those other sites. Conversion metrics you should track include registration for downloads and online form completions. Of course the ultimate metric is sales. Navigating the waters of social media can be daunting, but richly rewarding. It can also save you time and money in your marketing efforts: A recent HubSpot study showed that organizations that predominantly employ inbound marketing tactics such as blogging and social media experience a 61 percent lower cost per lead than outbound marketing-dominated organizations. Inbound marketing—“pulling in” a targeted audience with your content—offers an average cost per lead of $135 versus an average $346 cost per lead using outbound marketing, where you “push out” your message to an undifferentiated audience. Just as you should focus on the conversation and not the commission during the sales cycle, you should focus on the content, not the click when using social media. Taking just 30 minutes each week to organize a social media strategy can help you get the most out of using it as part of your overall marketing plan. If you are making your first foray into social media, it’s okay to start small. The point is, just start.